As the Earnings seasons kicked off in the U.S, Stocks were looking poised to wipe off the losses accumulated prior to Christmas last year. The U.S equities ended the 4-week winning streak on Friday on U.S-China trade talk optimism. Cryptos on the other hand rebounded from the earlier weekly lows creating higher lows at the time of writing. In Forex, USD rebounded strongly mostly due to the inherent weakness in Euro. Let’s review some weekly numbers before moving on. Cryptocurrencies have started the year on optimism that the digital assets would shape some kind of rebound on mainstream adoption & regulatory framework coming in effect. The Cryptos have so far moved in a tight range with some resilient bounces from the yearly lows. We are still searching for that elusive bottom, but we can look at the Bitcoin chart (hourly) to see how the technical patterns are dictating the short-term price patterns. BTC has so far held the trend line from the earlier low honoring the bullish trend line. If the Crypto kingpin is able to break free from the resistance around $3900, the bullish bias would aim for the previous high around $4200. The total market cap is $ 124 billion with the BTC dominance sitting @ 52.5% at the time of writing. Despite the continued bearish trend & price declines in the Cryptocurrencies, the digital assets are growing in recognition & adoption in financial trading markets. A couple of weeks ago, the Estonia-based tokenized trading platform DX.Exchange had launched the support for investors to trade in tokenized shares of the Nasdaq listed companies in collaboration with the second biggest stock market in the World. After the DE.Exchange launch, another Belarus-based startup Currency.com has launched a full functional tokenized securities platform. Currency.com is accessible to all types of investors and will issue over 10,000 tokenized securities (starting with 150+), which will track the underlying market price of common financial instruments, such as global equities, indices and commodities. On top of that, Huobi Derivatives Market which was only launched in November last year has already surpassed $20 billion worth of trade. All pointing towards a growing market share of digital assets. On the downside, Bitmain – the biggest miner in Cryptos continues to run into trouble with the closure of multiple facilities, with mining becoming increasingly non-profitable with the declining prices. China is also extending censorship of Cryptos to blockchain based projects to be overseen by the Cyberspace Administration of China (CAC) – some consider this as a roadblock for a pro-innovation movement which had so far gained much traction in the Chinese market. Remains to be seen whether this is just another attempt towards censorship or something wide-ranging as a regulatory framework. For the week, U.S stock indexes registered an impressive upside with Dow up +3%, the S&P climbing 2.9% and the Nasdaq rising 2.7%. The market sentiment was lifted by positive news emerging from the U.S-China trade standoff slowly moving towards a resolution & the earnings season kicking off on a positive note as well. Keep in mind though, cyclical factors are still pointing towards a slowdown in the Chinese economy, which the government is desperately trying to avoid by implementing a package of stimulus measures to boost its economy – they include a cut to VAT rates for selected industries and tax rebates for others, helping brighten the outlook for its economy and easing fears about a global slowdown. The following figure shows the astronomical climb in U.S National Debt which results in government closures as the ceiling is raised every time the previous one is breached. Meanwhile, Economic data from Europe pointed towards recession – German GDP grew 1.5% in 2018, compared with 2.2% in 2017, pointing to the weakest growth rate in five years, reasons including a trade war-induced economic slowdown, delays in auto output due to tougher pollution standards and a warmer-than-expected November that held down energy production. While investors are jubilant over fundamental factors like trade dispute, cyclical factors like a global economic slowdown is a bigger worry. Looking at the S&P 500 index, the price finally broke through the resistance as the month old climb from the low continues. A bearish trend line from the top might provide resistance next, but the RSI trajectory looks constructive & pointing towards further gain. However, nothing keeps climbing or falling in markets forever and we might see some correction here. Forex markets exhibited Dollar strength despite risk-on sentiment. While U.S commodity pairs remained choppy mostly, EURUSD once again failed to hold the gains from the previous period to end the week near the lows. The only exception to Dollar strength was the price action in GBPUSD which remained resilient in the backdrop of Brexit uncertainty. Considering the volatility in the pair & the unfolding events, as a result, can quickly make the pair to cave into some serious selling in the coming weeks. On a side note, banking giant HSBC settled $250 billion of forex trades using its proprietary blockchain platform “FX Everywhere,” HSBC handled 3 million transactions or 150,000 payments since it launched in February. The Dollar Index is at a critical juncture with a bounce from the MT support @ 95.00 but seems to be stalling at the ST resistance of 96.05. A convincing move upwards from here would signal a renewal in the bullish bias. However, a reversal from this resistance would confirm a lower high & aim for the previous low. Important economic data releases next week include rate decisions from Bank of Japan (BoJ) & European Central Bank (ECB), China’s GDP, Durable Goods orders & Advance retail sales out of U.S, New Zealand’s CPI, Canadian Retail sales & Australia’s employment numbers. Major risk event is UK PM Theresa May’s alternative Brexit Proposal to Parliament. 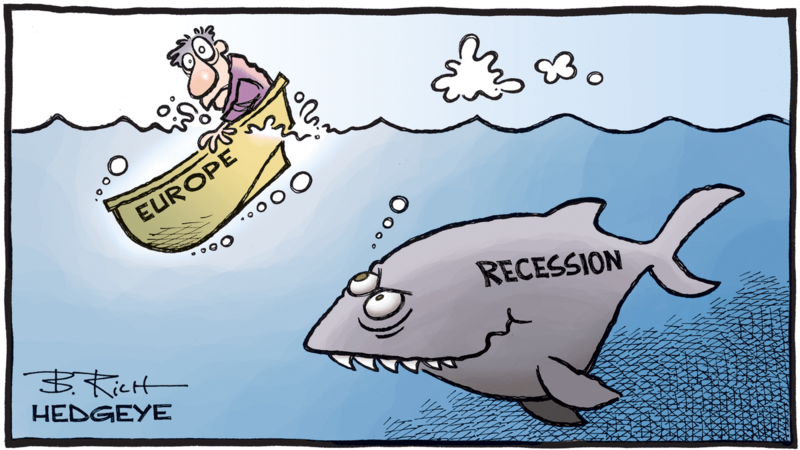 Signing off here with comic view of how Europe seems to be headed towards Recession. Previous articleWhat happens when platforms determine bias?